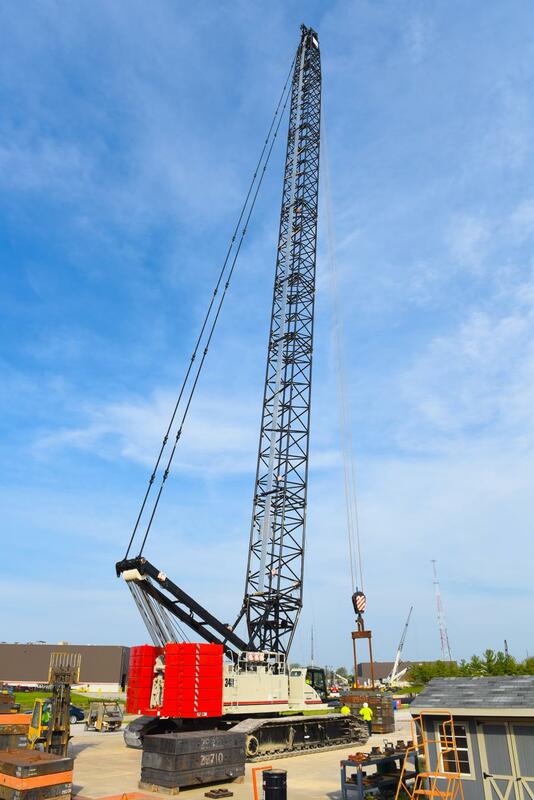 Link-Belt Cranes testing 220 ft. of boom with new 348 Series 2 at company headquarters in Lexington, Ky.
Link-Belt Cranes has introduced the all-new 348 Series 2 300-ton (273-t) lattice crawler crane. Over the years, Link-Belt's 348 class of lattice crawler has been job proven on projects from Prudoe Bay, Alaska, to Miami. Crane owners and operators will have a lot to like about the new 348 Series 2 300-ton (273-mt) lattice crawler crane, according to the manufacturer. First shipments of the new 348 Series 2 will begin fourth quarter 2018 following final testing in Lexington, Ky. Manufactured and assembled in North America with support around the globe, Cummins QSL 9 350 hp Tier IV Final and Tier III engine options are both available and deliver efficient power to a Kawasaki pump and motor package for fast, responsive, fingertip control providing simultaneous operation wherever it is needed. Dual swing motors provide dynamic control for the smooth free swing all Link-Belt HYLABS are known for having. The operator also can dial swing speed up or down with volume speed controls in the cab. Matching hydraulically driven main and auxiliary hoist drums utilize Link-Belt designed gear drives for either straight power-up/power-down auto brake mode, or also can incorporate an optional “wet clutch” free fall feature, if required. New ultra-wide hoist drum laggings, an integral part of the drum itself, provide the standard 28 mm hoist rope an extra-large circumference, extending rope life and offering maximum line pull of 53,306 lbs. (24,179 kg). Greater fuel economy is just one of the benefits offered with Series II ECO winch system, resulting in lower operating cost, less engine RPM under load, fewer emissions and all the line pull you need with 28 mm rope. When activated by the operator, ECO hoist provides maximum line speed with lighter loads all with the engine under 1,000 rpm. Also, standard equipped is operator-selectable “auto-engine shutdown” allowing the engine to shut down automatically after extended periods of inactivity, so long as critical operating criteria are met. The crane operator is assisted by on-board high-resolution winch-view, rear-view and non-cab side swing-view cameras to enhance jobsite visibility from within the cab. The operator's cab is highly functional and comfortable. Inside you will find full LED system monitor and adjustable armchair-mounted controls. The ergonomic design offers the operator greater visibility, more room, and a six-way adjustable seat. An audio/visual travel and swing alarm system alerts crew members on the ground when the crane swings or travels. The intuitive rated capacity limiter monitoring system provides the operator with all lift information, and allows the operator to set swing and other control parameters creating virtual walls with audio, visual alarms and function kick out. The 348 Series 2 has telematics in place to give current data to better forecast maintenance and service needs of the crane. New attachment on the 348 Series 2 allows the heavy duty boom top section to remain in place to transition from conventional mode to luffing configuration, eliminating the need to change out tops. Maximum heavy duty boom length is 300 ft. (91.4 m) and maximum heavy duty jib combination is 240 ft. (73.1 m) plus 140 ft. (42.7m). Maximum long range boom length is 355 ft. (108.2 m) and maximum long range jib combination is 295 ft. (89.9 m) plus 140 ft. (42.7m). A maximum combination of 180 ft. (54.8 m) of luffing boom and 240 ft. (73.1 m) of luffing jib provides 420 ft. (128 m) of attachment and a tip height of 419 ft. (127.7 m). The 348 Series 2 has a live mast cylinder for self-assembly and lattice extensions can be mixed and matched with existing conventional boom of 348 H5 models so you can use heavy duty, transition, and long range boom on the 348 Series 2. Two position track gauges offer owners variable track positions depending on the application: extended position provides a wide base for operations where conditions allow 22 ft. (6.71 m) and retracted at 19 ft. 2 in. (5.84 m) compliments for tighter, more restricted environments. Front and rear lower counterweights feature 'hook and pin' style car body design and consist of two stacked weights at the front and rear — top counterweight slab weighs 17,000 lbs. (7,711 kg) and lower weighs 20,000 lbs. (9,340 kg) — fitting neatly between the side frames even in fully retracted gauge. To accommodate varying transport regulations throughout North America, the 348 Series 2 is equipped with car body jacks and quick disconnects on lower hydraulics for quick and easy installation and removal of side frames when needed. Counterweight and lattice sections of the 348 Series 2 are also configured for minimal overflow loads. A new counterweight removal system can lift up to 227,000 lbs. (102,965 kg) of upper counterweight.